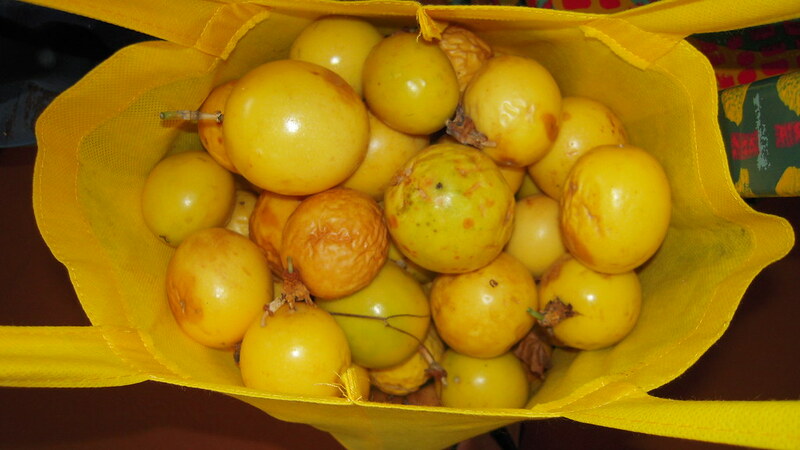 I’ve written about lilikoi in several posts. Check out the categories on the side under “FRUIT” and you’ll find both “lilikoi” and “passion fruit” (they are one and the same). The opening photo and the one below are shots of just a few of the lilikoi I brought back. 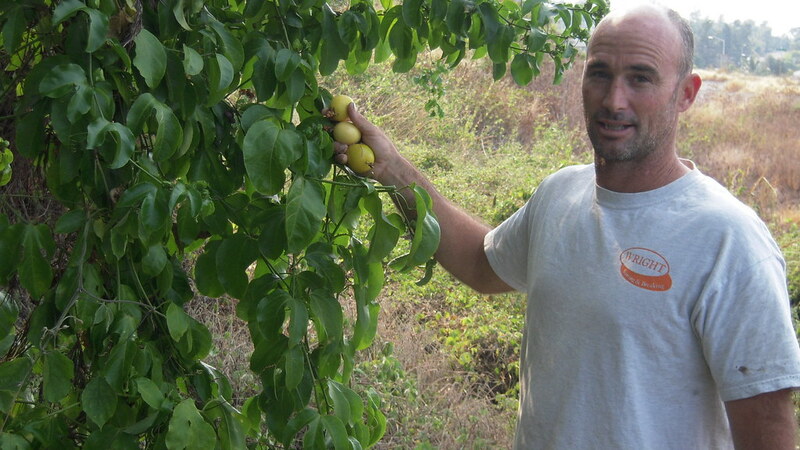 Chris took me on a hike down a trail on the back of their property where we gathered more lilikoi. He let me take pictures of the few left on the vines. Vines grow so high up into the trees that we usually have to wait for the top ones to drop to the ground. Even when they dry up and become a wrinkled brown, the insides are still delicious. 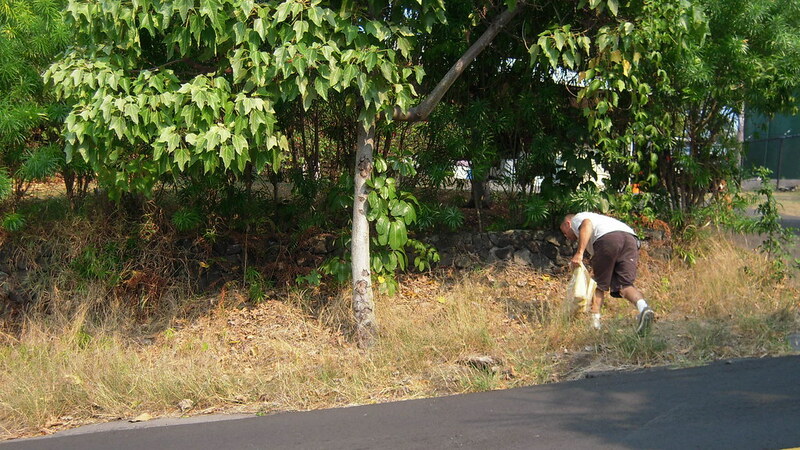 Just before I left, Chris ran across the street to gather more lilikoi. The vines grow up into whatever tree they are near. When a lilikoi is cut open, all you need to do is scoop out the insides with a spoon and eat (seeds and all). 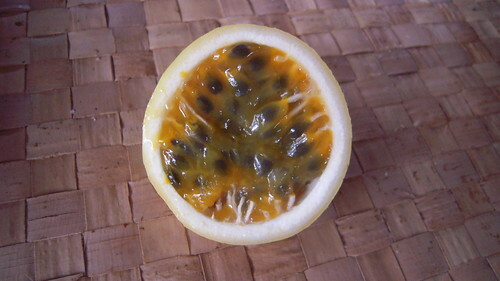 It is a sweet/tart flavor and the seeds have a gelatinous quality that makes them easy to eat. It’s making my mouth water to write this. I dumped lilikoi into my sink twice, scooping out the insides and putting them into a colander to let the juice flow through overnight. 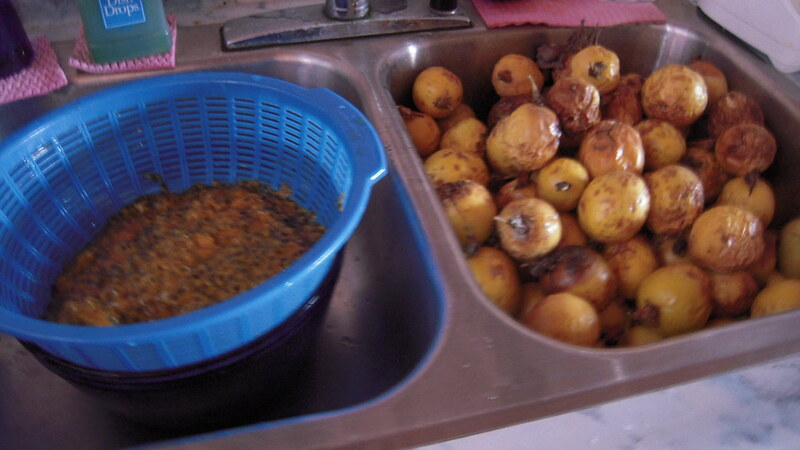 Another reader said she always put her lilikoi insides into a blender to separate seeds from pulp. I’d never tried that, but the next morning, I took the pulp that had remained in the colander, put it in the blender and zipped it up for a few seconds. Sure enough, it got out even more juice. So the combination of draining and blending might work. BONUS: I’ve said so many times that writing a blog is so educational. 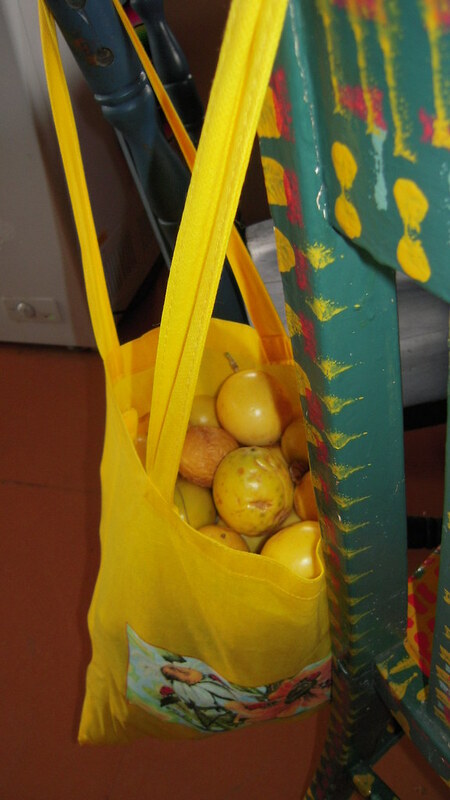 I had known about lilikoi, but on this excursion, I learned about something else that I intend to learn more about. Chris has started a project of aquaponics. 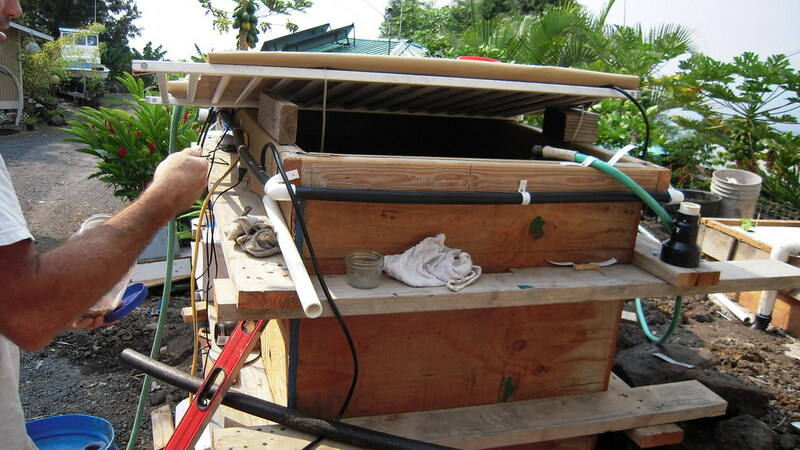 He starts with a tank of tilapia, a fish that’s widely used in aquaculture or aquaponics. This water containing nutrients (i.e., fish poop) from the tank is routed to another tank for lettuce. He took sheets of Styrofoam, cut a hole and inserted the pots. He said, “Get your camera ready,” and he lifted up one of the sheets so I could take a picture of the root system. The water from the lettuce is circulated back into the fish tank. When he gets ready to harvest, he simply lifts out the Styrofoam sheets to work on them in the house. Voila! You have locally grown organic veggies. 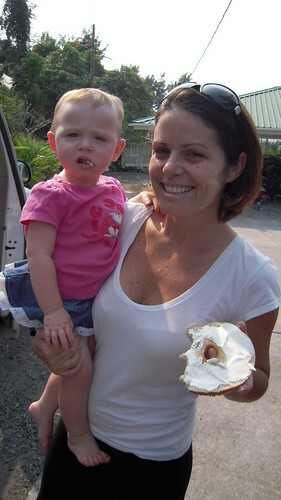 Thank you both, Chris and Alexis, for your lilikoi and a peek at your new project! This is definitely something I’d like to learn more about and investigate how it would work on my acre. WOW! Great article! Thanks so much, and wonderful work, Chris and Alexis. Chris is our student, and our very first affiliate, and we are very proud of him! Come to a farm tour, Saturdays at 10am. They’re free! Also, check out our website, http://www.friendlyaquaponics.com. 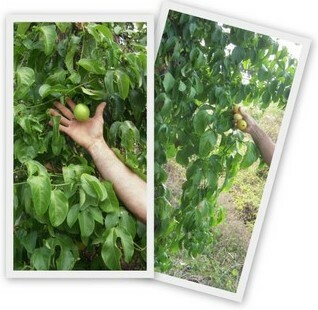 They are a great couple – and were my first introduction to aquaponics. 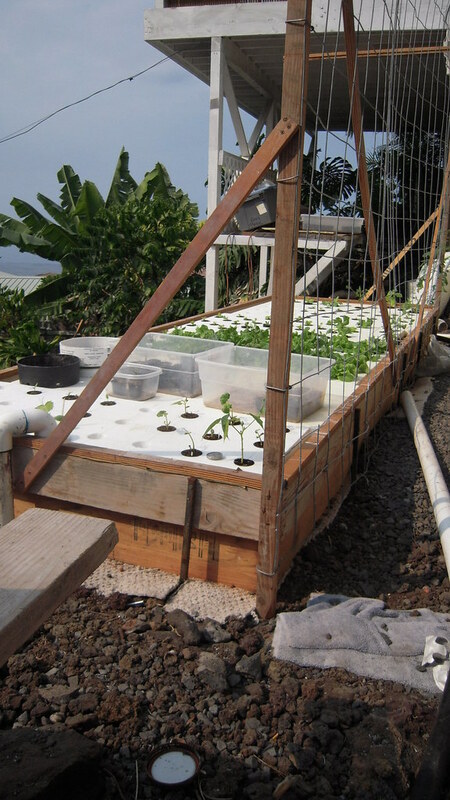 I recently did another article about people here in Ocean View who are doing aquaponics. Did you teach them, too? https://lavalily.com/2010/06/local-aquaponics/ I may be coming to you for lessons! I wish I could get up there more often to buy some of your produce! I’m so happy to hear that it’s going well for you. I’m sure Kililani is growing like a weed! Not sure if lilikoi has been tried with aquaponics. They do like a lot of water, but the problem is that lilikoi grows on vines that go everywhere. Containment would be the problem more than too much water. Maybe to get seeds started for transplanting it would work. Transplanting out of aquaponics into the ground is usually not a good idea, as the root mass rots before the roots can re-establish in the ground. 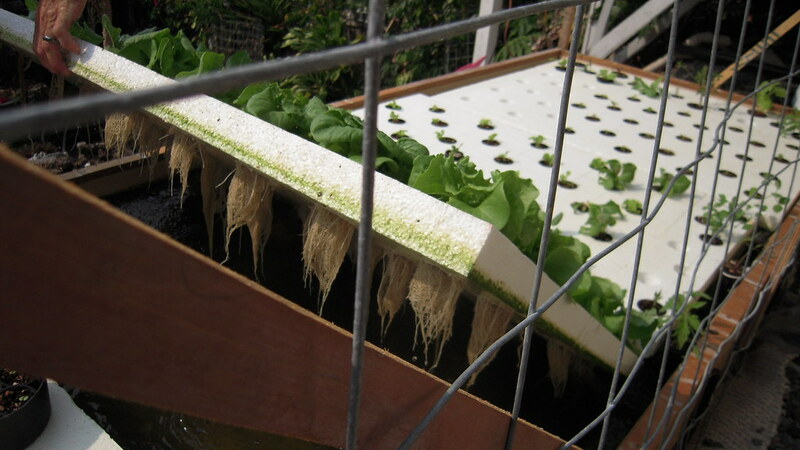 In addition, the roots structure is different in aquaponics, with no root hairs – which are necessary in the ground, to absorb moisture, but are not necessary in aquaponics. Lilikoi grows very well in aquaponics. Just stick a piece of vine into the trough, and it will root. Mahalo nui loa for the clarification. Since I don’t do aquaponics myself, I’m not exactly sure what works and what doesn’t. I’ve grown all my lilikoi from seed, then transplanted into the ground. Could I root lilikoi in water like I’ve done with pineapple even if I don’t do aquaponics?